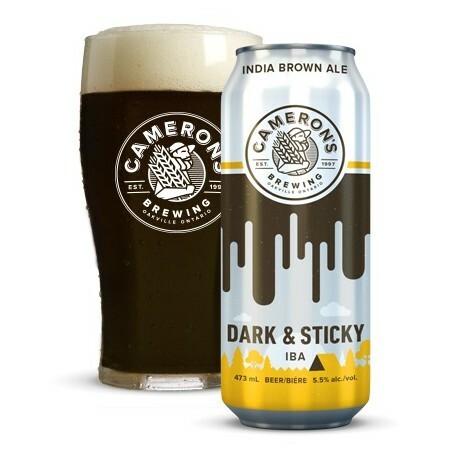 OAKVILLE, ON – Cameron’s Brewing has announced the release of a new seasonal beer as part of the latest edition of the Cameron’s Brewmaster’s Selection mixed pack. A delicious combination of two classic styles in one artfully crafted beer: that’s Dark and Sticky. This India Brown Ale mixes a hop-filled IPA with a well-balanced brown ale, combining the best of both worlds. The rich, dark full bodied malt profile is perfectly complimented with an intense dry hop of Idaho 7 and Falconers Flight giving this beer its “Dark and Sticky” deliciousness. Dark & Sticky IBA is available in the autumn/winter Brewmaster’s Selection package alongside the returning seasonal Black Forest Dark Lager, and year round brands Cosmic Cream Ale and Ambear Red Ale. The new mixed pack is available now at the Cameron’s retail store, and starting next week at select LCBO and grocery store locations in Ontario.